You know that saying. “A quilt is not a quilt until it is quilted.” Until then, it’s a quilt top or a piece of patchwork. The thing is, I think it is common to be caught up with thoughts of “how am I going to quilt it?.”…. Once the patchwork is done, there is often some agonising about the quilting. 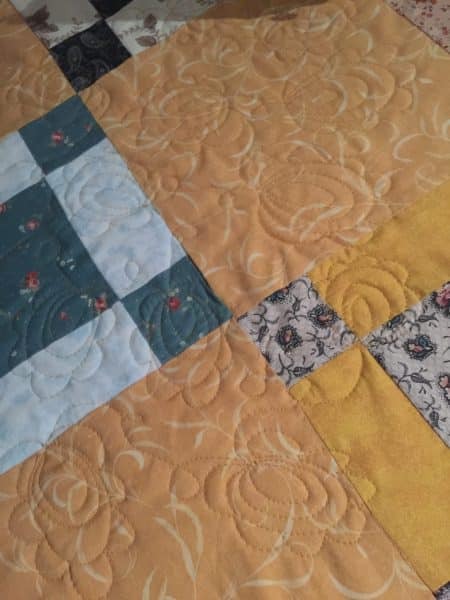 The worry of not wanting to “ruin” the top, Wanting to get the quilting “right”. Maybe we overthink it.? 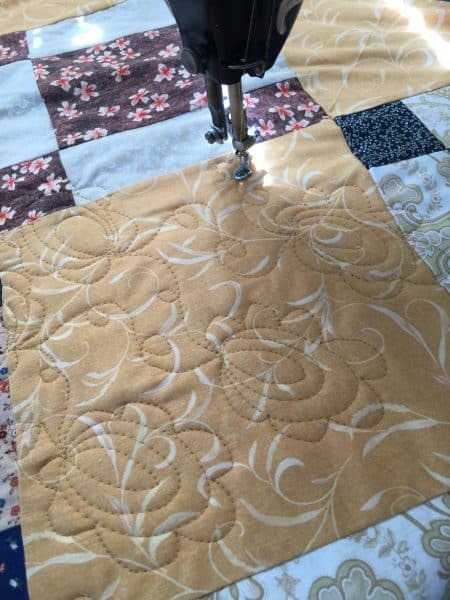 When it comes to busy patchwork tops and quilts which are intended to be used, I am always amazed at how wonderful the quilt top looks, once it is quilted – even with the most simple quilting stitches. Once its quilted, it becomes a quilt. Its tangible. It’s cuddly, it’s textured, it’s warm, comforting and the light falls differently on the undulations of the quilt. Its a great tactile experience. It’s actually a really nice experience to quilt your own quilts. I love free motion quilting. I think its very forgiving. It doesn’t have to be pefect. It makes your quilt unique to you. Its like doodling on fabric. Theraputic too. 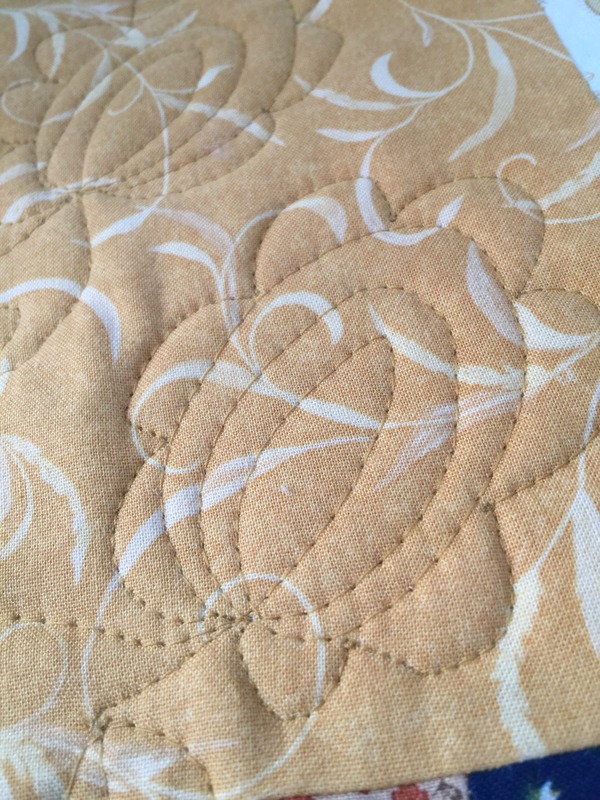 I started “Quilting Eggs” some time back, on a baby quilt I needed to get ready fast. Its a quick technique, flows very easily and can be fitted easily to fill spaces. 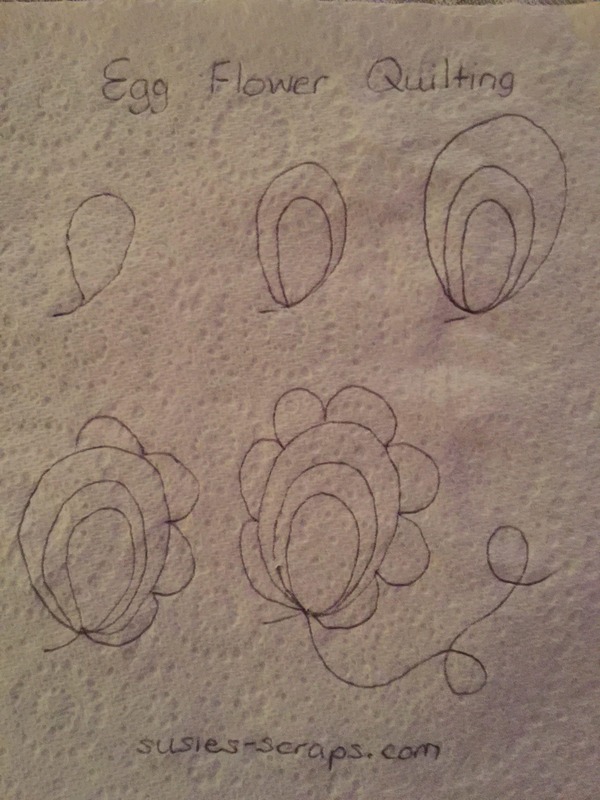 Today I’m quilting these Egg Flowers, which are an extension of the “eggs” by adding petals to the outside. Again it flows easily, gives nice texture to the quilt and works well for busy designs. This design is easily reproduced if you would like to try it at your house. Draw the design on paper for youself to prepare your mind. 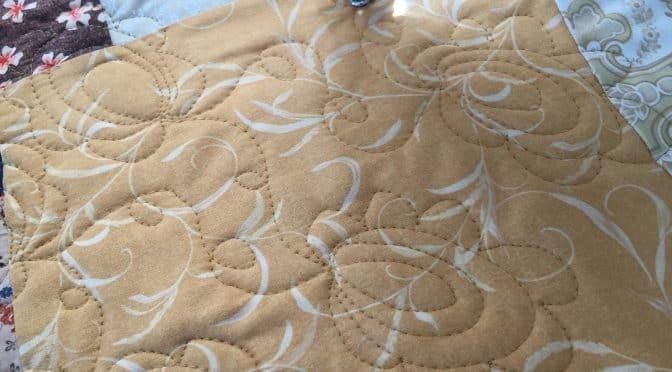 I always do a test quilting piece first, it is a good way to check how the machine is running and get the rhythm of the stitching. Here is how to do it. Follow the steps below to make the pattern. Make them a size you like. Quilt a loop or two in between each egg flower tohelp to move to ther next spot. May your Christmas be merry and bright! Best Wishes to you! Happy Holidays!